January 1815 In the Tsarskoye Selo Lyceum pass the first exams, passing which the students could go to the next course. Everything happens in an atmosphere of solemnity, invited many guests. The action takes place in the large hall of the Lyceum. All the guests gathered here – parents of students, academics. Among those invited was the poet Derzhavin, who had come to examine Russian literature. In the center of the picture is young Pushkin reading his own poem about Tsarskoye Selo. The fact is that the exam in Russian literature included the recitation of his own work. Pushkin, a short, curly teenager, embodies dynamism, liveliness. The verse is read with passion, with active gestures. Many guests – in ceremonial uniforms. There are also military men – only a few years after 1812, and still fresh in memory. Derzhavin – a tall gray-haired man in a red uniform – got up to hear the young poet better. There are two reasons for this. First, Derzhavin is already over 70, he has very little time left to live. Secondly, this is the transfer of the baton from the old poet to the young. The picture is made in bright bright colors, conveying the dynamics of movement, life, passion for poetry. The painting “Pushkin in Tsarskoe Selo” was commissioned by the famous artist Repin for the centenary of the founding of the Imperial Lyceum. 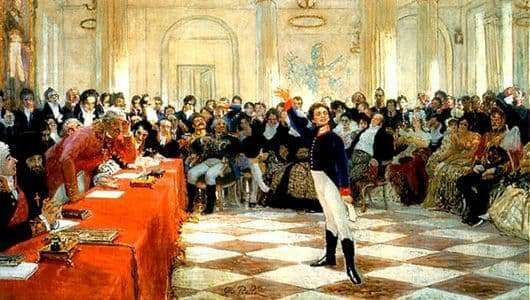 For maximum realism, the Lyceum students of the beginning of the 20th century conducted a performance of the 1815 exam, especially for the artist. Repin approached the case with maximum responsibility. Thus, in order to create an image of Derzhavin, he had to study the two-volume book “Life of Derzhavin”, the complete collection of Derzhavin himself, his diaries. Work on the picture lasted for several months and, according to friends, by the end of his work could have been mistaken for a Pushkinist.